Many people believe that the construction of the chicken coop takes a lot of time and money. However, this is not true. If the entire course of the work will be well planned out, the construction of the chicken coop with your own hands will not be such an impossible stunt even for a beginner in this business. Especially, when there is such a wonderful book on the construction of a chicken coop with your own hands “Building A Chicken Coop”. 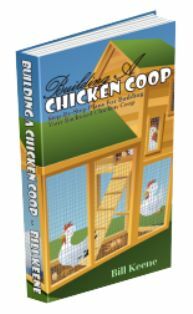 In this book you will find dozens of plans for chicken coops equipped with step by step directions on their construction. After the decision to build a chicken coop, a breeder should think about the place where chicken coop will be built. First and foremost, the place for this building should be completely safe. The territory of the suburban area, or the part of the yard, where chickens will live, should enclose a reliable fence or a thick hedge. This obstacle will help protect the livestock from predators and strangers. Chicken coop should be in the most distant part of the fenced yard. Often walking people and pets should not be there, as some breeds of chickens are experiencing severe stress while finding strangers in the yard. Ideal place for a chicken coop is in partially shaded and covered place. It is desirable to put chicken coop near dense bushes. They will provide a solid shade in sunny weather and in rainy and windy – will be a perfect hiding place for the birds. Normally under bushes settle various insects, so the chickens like rummaging in the ground near that bushes. The chicken coop should be placed on hill, because it will be difficult for birds to walk in the walley: that places has too much moisture, and snow melting very slowly. The chicken coop should be located wisely. The rectangular building should be placed from east to west. The ideal placement of the chicken coop will be when its windows facing south and the door – the east. During the day time as much as possible sunlight should come into the chicken coop. Temporary extension of daylight significant effect on chicken’s egg production. However, the window should be overshadowed in the heat. Too high and too low temperature is very negative for the chickens. Even at +25° C decreases get low the productivity of the birds for the 50%, and if the temperature rises by another 5 degrees, all chickens will stop laying. In the case of heat, the chicken coop windows must be equipped with plywood shutters. +12° C considered as an optimal temperature in the winter time. Chickens should feel relaxed, so you need to choose the place of the chicken coop away from areas of active rest. Protection the chicken coop with the hedge is a good idea. Location should be chosen based on the dimensions of the future building. Each of 1 м2 of the chicken coop should have no more than two chickens. If the chickens will live in a chicken coop in winter time, it is necessary to provide tambour, as part of the chicken coop insulation to make sure that the cold air does not pass directly to the birds. For tambour also need to take place in terms of construction. Experts recommending to choose a place with a reserve area in case if luck in breeding chickens motivates owners to create, for example, quail farm. After all, this farm is not only an excellent source of additional income but complete income.